We specialise in the manufacture and supply of reproduction parts for the Suzuki T500 Mk.1 'Cobra'. 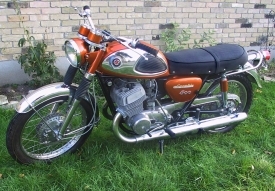 This classic and very collectable motorcycle proved that a 500cc two stroke engine could not only be built, but be highly successful! In fact the production run lasted a decade - 1967 to 1977!! Our Reproduction Parts are manufactured only when they become NLA (no longer available) from Suzuki. We supply some other model Suzuki T/GT parts as well! Check the list below. 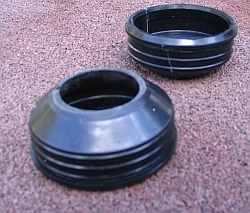 Cobra knee rubber pads. These are professionally made from high quality rubber - they fit perfectly!! Cobra handlebar rubber grips, 100% replicas made from high quality rubber. 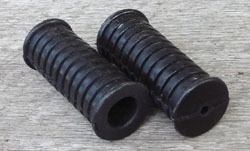 Muffler cones and rubber mounting rings (clips) for Suzuki GT750J/K. These are an exact replica of the originals, perhaps even better! Plastic sidecovers for Suzuki T/GT500 - very high quality! 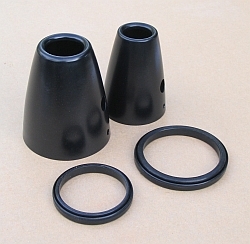 GT500 fork dust boots -100% replicas made from high quality rubber.